A young soldier stands on guard looking attentively for the enemy. Behind him, a couple of his compatriots along with an older man and a boy sit on a large consignment of gun barrels. Well, as often the truth is less exciting. These are cast iron drain pipes, presumably part of the installation of sewers at that time. And a comment posted on our web site by Tim Potter says: “Outside Perce Jeeps’ barn. 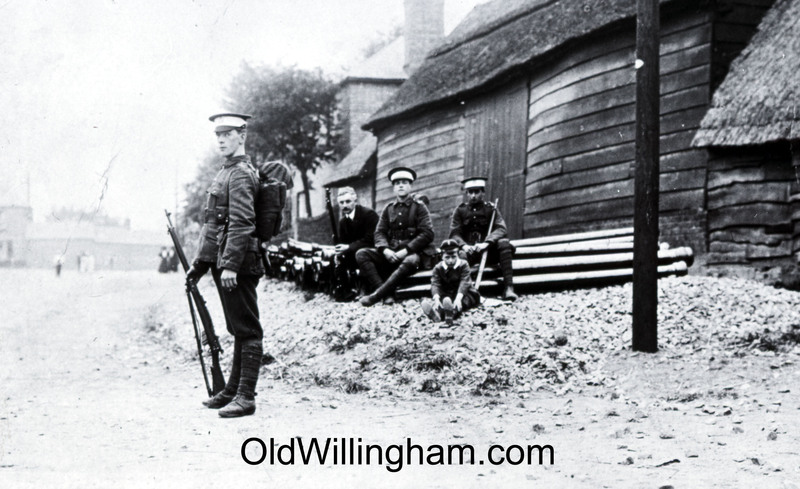 I remember my Grandfather who was a WWI soldiers saying that these were Officer Cadets from Cambridge University UOTC.” The barn was on the corner of George St. and Pound Lane.